15 gas is better than 16 gas Reaper expand for 1-1-1 in the match up, and this is usually what Maru goes for. It is not uncommon enough to read too much into it. Classic opened up with a two Gateway with one proxy, which aims to cancel the Command Centre on the low ground. This opening was pretty popular near the end of last year. When the Scv saw no Nexus at the natural, some Terran choose to build the Command Centre on the high ground. Some also cancel the Command Centre and rebuild it on the high ground, after they scouted the main (knowing what is coming). Another reaction is to build a Bunker on the low ground immediately, but this could be risky as it may barely not finish on time. This response is more suitable for 16 gas than 15 gas Reaper expand, because the bit of mineral to gas ratio difference really matters at that specific time frame if you want to afford the Bunker and Supply Depot. The game then proceeds to a two base macro. Maru went for a 1-1-1 with Cyclone being the first unit, which is the best choice when you do not know what tech Protoss chose. On the other hand, Classic chose Twilight Council for Blink. After Reaper scouted the Twlight Council tech, Maru chose to build a Banshee. The Banshee is a good choice for a two base 1-1-1 push (for reference), which is designed as a response to Twilight Council tech. However, upon seeing no third Nexus and no gas taken at the natural, Maru cancel his Banshee and make a Raven instead (see image below). This is because, the information gathered suggests Classic planned to attack with mass Gateway units (likely Blink Stalkers), and a two base 1-1-1 push would be very bad against it. The Raven is not exactly an excellent choice in this situation, but there is no better choice. Classic was very decisive with his attack by blinking in to kill a Tank, as allowing Terran to accumulate several Tanks is the last thing you want to do with this build. But Classic made some bad trades due to poor micro, and that basically killed the momentum. Classic later put down a third Nexus, two Forge, a Robotic Facility, and five more Gateways to transition to a macro game. This means he was cutting units, which made him vulnerable in this transition period. Maru won the game with a typical move out with everything when he had two Medivac with Stim, Combat Shield, and +1 Infantry attack. One thing interesting is Maru chose to use Interference Matrix on the Sentry rather than Anti-Armor Missile on the Zealots in that engagement. Game 1 shows that Classic’s plan was to take initiative in the early game and use that to dictate the mid game. Maru simply reacted to what Classic did. Maru chose to use a 15 gas instead of 16 gas Reaper expand in this game, while Classic did the opening again. Interestingly, Classic wall off the natural with a Pylon, a Gateway, and a Cybernetic Core. Judging from the timing of the Cybernetic Core, it can be two Gateway (with a proxy), early pressure with a slightly later Nexus (but you don’t usually wall off – could be mind game), or proxy tech. By the time Maru knew it was a proxy Gateway, the Stalker already arrived at the natural to kill the Scv building the Command Centre. 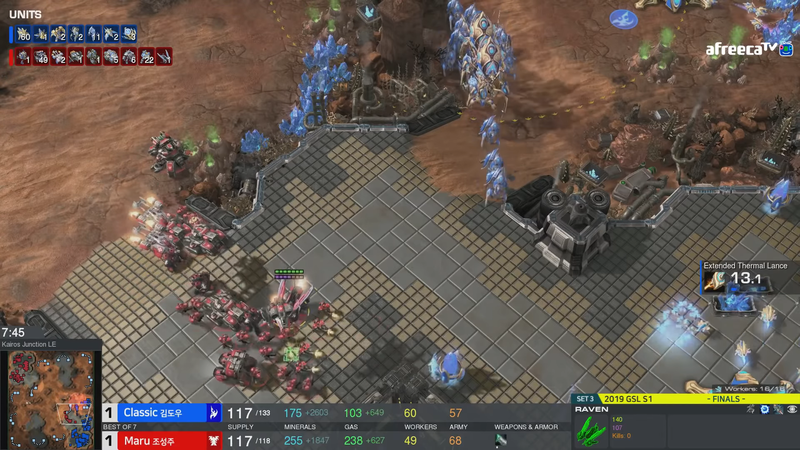 Maru placed a Bunker immediately in game 1 but not in game 2. It made me wonder if it is the difference with 15 gas and 16 gas as mentioned earlier, or he is simply calling Classic’s bluff. 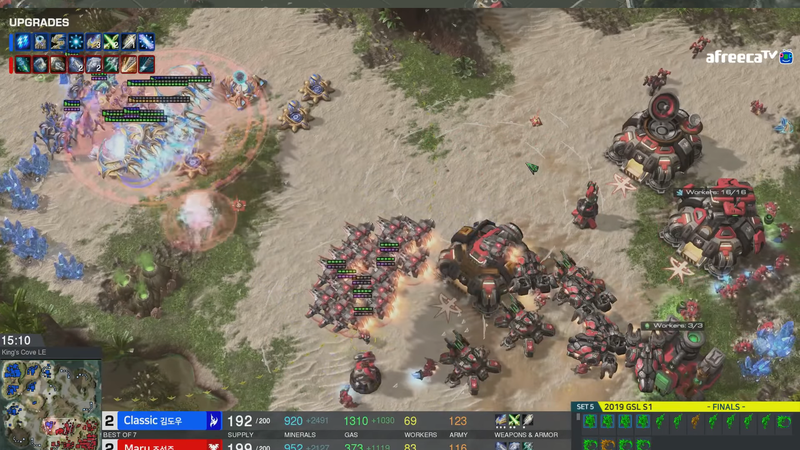 But he put down a Bunker with the same 15 gas opening in game 3, suggesting Maru chose not to build it. Classic’s opening accomplished what he aimed to do. The Command Centre was drastically delayed, many Scvs were killed, and the Command Centre had to lift to the high ground upon completion. Maru was very behind at this point, and Classic followed up with an expand into Stargate. I was watching it with some friends at my place, and one asked why Classic made Phoenix and no Oracle. My answer was that, Maru was forced to turtle up on one base, so it is less likely for Maru’s units to be out of position against the Oracle. More importantly, since Maru was so behind, he should be looking to make certain “come back” play to give himself a chance to come back. That usually means it is either Widow Mine drop or Cloak Banshee, and Phoenix map control is a good option for both. Classic’s positioning of the Phoenix in the game shows that he was thinking exactly that. The group of Phoenix basically means harassment is unrealistic and an early push is not an option. Classic continued to shave off Maru’s units with Stalkers and Phoenix, while he was expanding behind it. Maru’s plan was to be defensive and take it to the late game in order to stand a chance. Maru did really well defensively with Siege Tank and Liberator, but Classic simply had too much and broke through the defense. Again, in game 2, Classic showed that he wanted to take the initiative. I was saying, if Classic didn’t take this game, this would be a 4-0. If you cannot win a game with that much advantage early on, you probably don’t stand a chance. Classic went for a one Gateway expand with Cybernetic Core before Nexus. This opening is good on this map, because it has a short ground distance. The Adept with an earlier Cybernetic Core aims to kill the Scv building to Command Centre and delay the expansion. The other reason to use this opening rather than the standard Nexus before Cybernetic Core is to counter the Reaper damage at the start. The three second nerf to Adept production also means that Reaper has a small window on Kairos Junction to pick off one or two Probe. Maru put down a Bunker immediately at the natural after he scouted Classic’s opening. Still Maru took quite some damage from the Core before Nexus opening. Maru went for 1-1-1 again, because it is still the best option. While Classic went for a Stargate tech path with Phoenix again, he followed it up with an early Robotic Facility (before additional Gateways). He made three Phoenix rather than his usual five, then he tech quickly to Colossus and take a third Nexus. On the other side, Maru power up with 3-1-1, and he made multiple Siege Tank and a Raven. The game ended in a weird way because Classic was out of position. Classic was expecting Maru to attack the third, but Maru attack the natural. The Tanks managed to position themselves at the key location, and that made a huge difference. 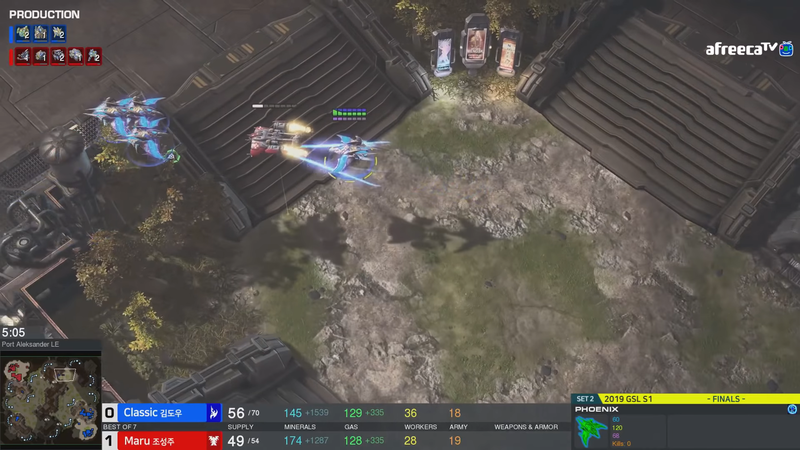 It is difficult to fault Classic’s positioning, because Terran love to do Tank push at the third on this map. This is an interesting game. Maru’s Scv scout saw no Nexus at the natural and the second geyser was taken earlier than normal. This usually means proxy tech. 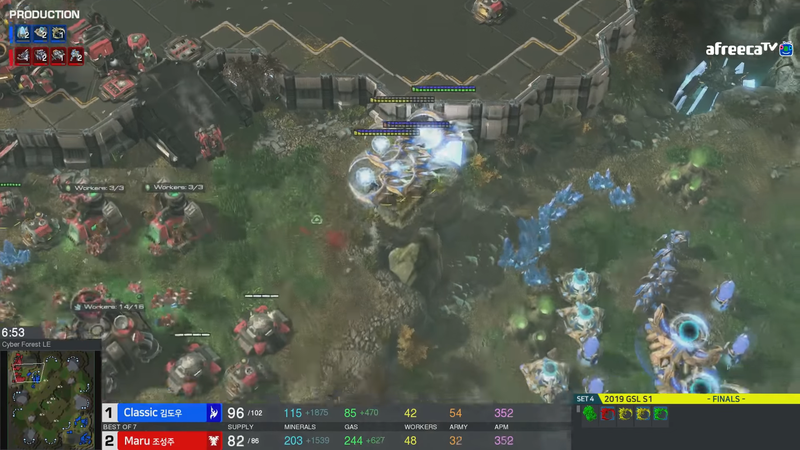 But Maru also saw two Pylon in Classic base, so things just seem odd from Maru’s perspective. The Scv in base essentially prevents Classic from putting down the planned Stargate, because his strategy builds on the element of surprise. 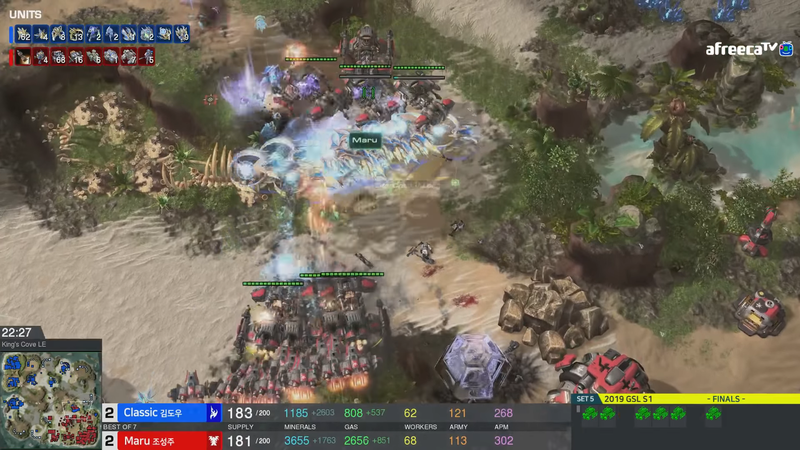 Maru’s Scv died before he got to see the Nexus, so he just did what he had done in game 1 by putting down a Bunker at the natural. 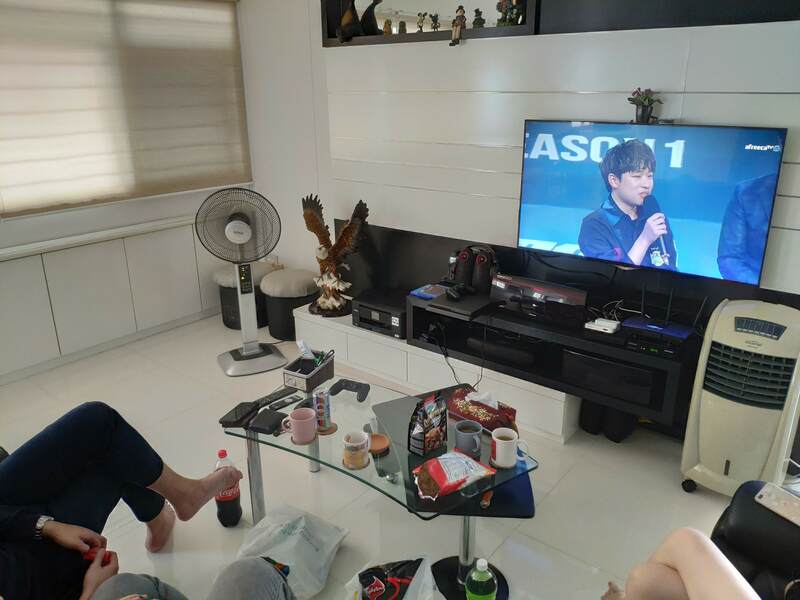 Maru sent another Scv to scout around the map and found that Classic wall off the natural. It is pretty scary for Terran, as you have no information but you know something is coming soon. Classic’s plan was to abuse the map and use Tempest to siege Maru’s natural with Shield Battery support. Maru’s scan revealed the Fleet Beacon at 5:00, and that was huge. Interestingly, Maru’s immediate response is to get Cyclone and Mag-Field Accelerator update. Although Cyclone’s Lock-On damage range (15) is longer than Tempest’s ground attack range (10), its range to target the Lock-On (7) is shorter than Tempest’s ground attack range. Classic’s Tempest just snipe the Cyclone whenever one tried to secure a Lock-On. It is difficult to judge if that is the best response. My intuition would be to get Reactor Viking. Maru’s expression after the game was funny. 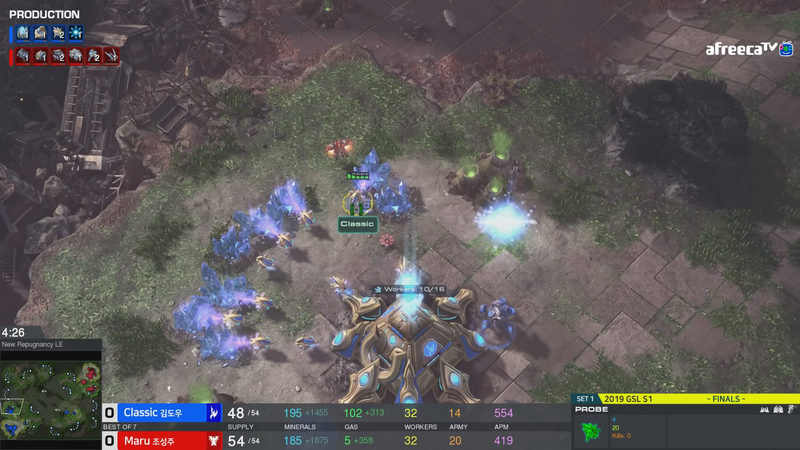 Classic placed a proxy second Gateway again, but this time round it is very close to Maru’s base. Maru also responded with a Bunker at the natural again. However, the proxy distance was so much closer that the Bunker didn’t get to complete, and Maru was forced to pull Scvs. The game quickly stabilised when the Bunker went up. Classic chose a Stargate tech path for Phoenix control, while Maru stuck with 1-1-1 (prioritise Cyclone over Starport). As mentioned earlier, with the Phoenix map control, Maru’s best option is to not push out. Maru chose to go for the extreme late game by getting Siege Tank and Liberator, and this is something that TY and Maru had some success with recently (for reference). King’s cove is also a good map to execute this strategy, because the four bases are close to each other. The mid to late game of this strategy usually goes like this. Terran get Siege Tank and Liberator with range to secure the key areas for defense, while Protoss would try to break the area with Tempest (with Shield Battery support). Terran would then response by getting Viking to counter the Tempest, and then Protoss would get High Templar to counter Viking. Terran would add Ghost into the mix to zone out the High Templar. The game would proceed to the dance off stage of both sides poking at each other. This is exactly what happened in the game. Thus far, I had seen two good moves from Protoss in this situation from recent games. The first is to take advantage of the low mobility of Siege Tank and Liberator by sending Warp Prism at different locations (see Neeb vs. Maru vod below). The other is to use Blink Dark Templar (see Dear vs. Maru vod below), which is something Blizzard had in mind when they introduced Shadow Stride. I recalled that after Maru lost to Dear’s Blink Dark Templar on this same map, he said he was surprised how strong Blink Dark Templar was even when he had many Orbital Command. In this game, it is clear that Maru had learned from his mistakes. He prepared Missile Turret and Widow Mine to prevent Warp Prism flying in from the side. You can see that Classic kept trying to send two to three Warp Prism into Maru’s main each time, and hoping that at least one survived. Maru also set up Widow Mine, Missile Turret, and Liberator at the path that Dark Templar would attack from. 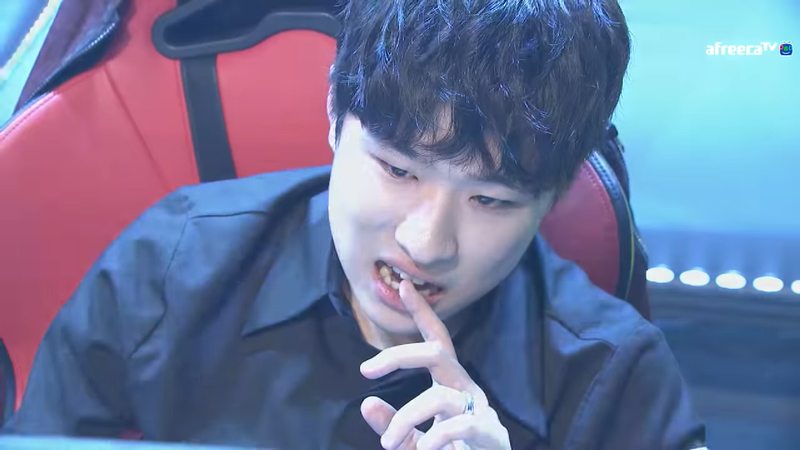 One notable change in the mid game that Maru did in this game compared to his previous games using the same strategy is he built fewer Liberator and Siege Tank. It is basically a game of rock-paper-scissors, whereby both sides try to have the better composition to counter opponent’s. Protoss learned that they could not make Colossus and Gateway units to break Siege Tank and Liberator, so they focus on getting other counter units. In response, Maru made fewer Siege Tank and Liberator. The dance off between Tempest and friends put a clock on Terran, because the longer it lasts the more Tempest is going to chip off Terran units. Maru’s response to that is Battlecruiser. Classic simply wasn’t prepared for that. But i must say, it wasn’t the Battlecruiser that won Maru the game, but rather it is his immense defensive play through out the game that allows him to get the Battlecruiser. This goes down as the best game of 2019 so far. Maru did not get his 1-1-1, and he went for an early third Command Centre on one gas. Early three Command Centre is not a bad idea on this map. On the other side, Classic went for a Twilight Council tech, but he chose the unorthodox Dark Shrine instead of typical upgrades. Classic’s gamble did not pay off. The extra Orbital Command gave Maru even more scan, and then things went down hill for Protoss from there. The successful Widow Mine drop was icing on the cake. Classic wasn’t expecting a drop at that time, which was later than normal due to the delayed 1-1-1 for the earlier third Command Centre. Maru won the game with a standard push once his upgrades were completed. Classic defended very well with what he had, but Maru had too much. This series shows how much of a god Maru is right now. After watching the games again, I find it extremely hard to pick fault in Maru’s play. Everything is just so solid. TY and INnoVation are arguably the next two best Terran now, and there is a bit of a distance between them and Maru. In my opinion Maru was very lucky that other terrans were eliminated earlier since it looks like TvT is by far his worst matchup, though his TvP is most impressive. Yes and no I guess. Maru’s TvT is not as godly as his other two match up, but it is still of the highest level. I would bet on TY to defeat him though if Trap didn’t get in the way. Great article,your writing is fantastic.